The future king of England, Prince George, son of Duke and Duchess of Cambridge will be christened at St James’s Palace later today. The historic 45-minute service will be conducted by the Archbishop of Canterbury at the Chapel Royal at St James’s Palace. After the birth of the prince on 22nd July this year, there have been very few occasions when he has appeared in public. The present ceremony, though intimate will however allow the world once again to catch a glimpse of the most talked about baby of the year. What is also extremely special about the day is it will witness four generations of British monarchs photographed together for the first time since 1899. The last time this happened was during christening of Edward VIII. He was cradled by great-grandmother Queen Victoria, alongside his father George V and grandfather Edward VII. The official photographer chosen to click this historic moment is Jason Bell, known as a cutting edge celebrity photographer. He will take the photographs at the Clarence House following the service in the Chapel Royal. Breaking the royal tradition of holding the Baptism ceremony at the Buckingham Palace where the Queen, Prince Charles and Prince William were all christened, the Duke and Duchess chose to hold the ceremony at the ancient 16th Century Chapel Royal. It is the same place where Princess Diana’s coffin rested before her funeral in 1997. 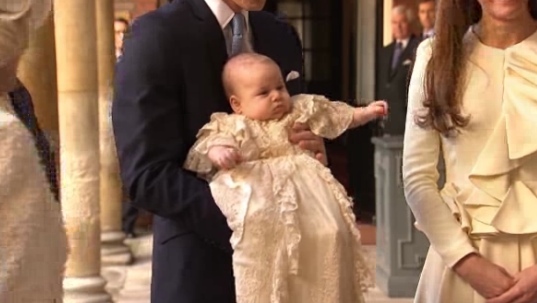 For this extremely special ceremony the baby prince will be dressed in a Honiton lace christening gown, a replica of the one used by more than 60 members of the Royal Family since 1841. The prince will be brought from the Kensington Palace. The Lily font used by the Archbishop will be brought from the Tower of London where it is normally housed as part of the crown jewels. Prince William and Kate will be joined by 60 close members of the family and friends. Among the guests are the prince’s great-grandmother, Queen Elizabeth II, and Prince Philip, as well as Prince Charles, the Duchess of Cornwall and Prince Harry. Catherine’s parents, Carole and Michael Middleton, and siblings, James and Pippa Middleton, will also be present. Family members Princess Anne, Prince Andrew and Prince Edward may not attend the ceremony due to prior commitments. The Duke and Duchess also announced the name of seven Godparents who will attend the ceremony with their spouses. Among them is Prince William’s cousin Zara Tindall, daughter of Princess Anne, and close friend of the couple. Oliver Baker, who got to know William and Catherine at St. Andrew’s University, Emilia Jardine-Paterson, who went to school with Catherine, and William van Cutsem, a childhood friend of William. 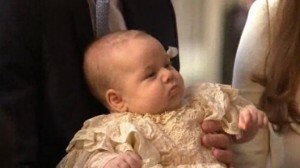 The other godparents are Jamie Lowther-Pinkerton, a former private secretary to the Duke and Duchess of Cambridge and Prince Harry; Julia Samuel, who was a good friend of William’s mother, Diana, Princess of Wales; and Earl Grosvenor, son of the Duke of Westminster. After the service, Prince Charles and Camilla, Duchess of Cornwall, will give a private tea at Clarence House. The guests will be served slices of christening cake, which is a tier taken from William and Catherine’s 2011 wedding cake. In a short message, Archbishop Welby said that it was a momentous occasion. The three month old has another honor to his name. He is the first royal baby to be honored with a coin celebrating the christening by the Royal Mint. The limited edition gold “kilo coin” is being sold for £50,000 ($80,000) – but a more affordable “Brilliant Uncirculated” £5 coin costs £13($21). This £5 coin has been made in silver – because the crossing of a baby’s palm with silver is said to bring good health and prosperity to newborns – and gold to commemorate the royal celebration. The Royal Mint said it has received thousands of pre-orders from within the UK and around the world. The design of this coin was approved by the Duke and Duchess and the Queen. Meanwhile the craze to witness history has gripped Royal fans. There were many who decided to spend the night out in the open in front of the Chapel Royal to get a good view of the guests when they begin arriving. Some prayed that there were no rains although they have also brought tents, tarpaulins and umbrellas to keep themselves dry. The ceremony is to take place at 3.00 pm British time on Wednesday and last for 45 minutes. During his ceremony, Prince William is said to have cried a lot, uncomfortable surely with all the attention garnered on him. The Queen was overheard saying at the time, “He certainly has a good pair of lungs.” Hopefully, Prince George will enjoy this significant day’s proceedings much better than his father.